If you’re looking for the perfect bridal gown, a pearl wedding dress is definitely an ideal choice. And if you’re just looking for inspiration, then prepare yourself to be truly amazed. A pearl encrusted wedding dress is a go-to source when you’re looking to accentuate your femininity. We all agree that pearls have an eternal beauty and a timeless elegance, so wearing a wedding dress with pearls will help you achieve a spectacular and flawless look. In continuation to our post about pearl wedding cakes, which can be read here, we decided to show you a fascinating selection of wedding dresses which aims to help you choose THE dress at least a little bit. A pearl wedding dress is more than just a wedding dress. This can be confirmed by all the 16 bridal designers and shop owners who happily agreed to be featured on this blog. We would like to thank each and every one for sharing their precious work and their passion for design and pearls. Those who create a pearl wedding gown actually create a story. Carrying the value of cultured pearls, this kind of bridal gown can really express thousands of emotions. On one side, the bridal gown contains all the feelings invested by the gifted designer. On the other side, it represents your unique and authentic emotions that overwhelm you when you have it on. In a magical way, on the day of your marriage, it perfectly blends with your body and soul in the same time. And that’s because pearls have a distinctive way of telling a story. Pearls are delicate, so they need a delicate hand to handle them. Picking the perfect dress is often the most challenging part of the marriage preparation, so the designer’s mission is to help us overcome this challenge. The irreproachable craftsmanship steps in to create an elegant and sensational pearl wedding dress design that will be remembered not only by the future bride, but also by the guests. Alin Le Kal found his inclination for designing gowns at an early age and decided to pursue his dream by attending formal studies in couture construction. He then founded his Bridal & Couture Fashion House, located in Melbourne, Australia. His name is now synonymous with elegance, grace and femininity. Dedicated to creating exquisite couture, Alin Le Kal knows how to include pearls in his designs. Just look at these pearl wedding dresses and see for yourself how he creates magnificent pieces of art. You can also visit the website. Follow @alinlekal on IG. The photo is from their account. No matter what style characterizes you best, classic, traditional or dramatic, every gown from Allure Bridals will make you feel glamorous. You will definitely shine in an Allure bridal gown. As an award-winning manufacturer, they are committed to create the perfect design which satisfies all tastes. Their pearl wedding gowns are simply stunning! All of their collections can be found here. Follow @allurebridals on IG. The photo is from their account. “You are beautiful. We only make the rest of the World know about it.” This is the motto that welcomes you when you enter into Alon Livné’s world and we absolutely love this mindset. Names like Naomi Campbell, Beyoncé, or Lady Gaga endorsed his work during various fashion projects, and he is showing his collections regularly at NYFW. Here are some dazzling pearl wedding dresses from his bridal line “Alon Livné White”. You can find more exquisite wedding dresses here. Follow @livnewhite on IG. The photos are from their archive. Founded by Angelina Arcaro, an award-winning Perth Designer Couturier, Arcaro Couture creates one of a kind bridal wear for the most pretentious bride. Her abilities to recreate the old Hollywood glamour, to apply vintage styling, or cutting edge details, make her work innovative, sensual and outstanding. What’s really remarkable about her work, is that she only uses real pearls as decorations. Angelina is such a dedicated designer that she personally meets and discusses every little detail with her clients in order to meet their expectations. Arcaro Couture also specializes in plus size brides. You can check these gorgeous wedding dresses with real pearls and lace and flowing feminine lines. For more designs you can visit their website. Follow @arcarocouture. The photos are from their archive. Seeing the smile on the bride’s face is their key to their business. Daniella Abi Bridal Couture knows how to please a bride to be. Daniella is willing to go above and beyond to meet your expectations and her work demonstrates this. The pearl decorated wedding dresses are simply beautiful. You can find here of her designs on Instagram. Follow @daniellaabi_couture. The photo is from their account. Emma Beaumont Designed was founded in 2012, after Emma specialized in couture sewing and garment construction at the University of Rochester. Based in Knutsford, Emma’s studio is a family business run with love and passion for gorgeous bespoke wedding dresses. So, if you want a bridal gown which fits you perfectly, and makes you smile instantly, just take a look at these designs. They clearly demonstrate the attention to detail and the talent of the dressmaker. 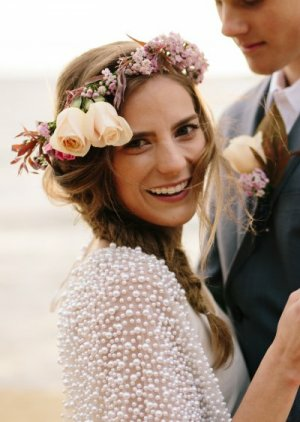 The pearl encrusted wedding dress is absolutely stunning! You can find more happy brides here. Follow @emma_beaumont_atelier on IG. The photo is from their account. Sophisticated, elegant, bespoke. That’s exactly how her wedding dresses are. You’ll see from the designs we selected to show you. Based in South Africa, Janita’s studio will instantly make you feel relaxed and welcomed. Every experience is personal and intimate so you can get the attention you deserve. More designs can be found on her website too. Follow @janitatoerien on IG. Photo credit @heisvisual. Janita Toerien Jumpsuit. Photo credit @wesleyvorsterphotography. Janita Toerien Pearl Wedding Dress. Photo credit @lovemadevisible. Janita Toerien Wedding Dress. Photo credit @janeulla_photography_design. A pearl wedding dress from head to toe? YES! Jennifer has the necessary skills to create your dream dress. She discovered her passion for sewing and creating while assisting her mother in many sewing projects. All her wedding dresses are fascinating, but the pearl gown is an absolute master piece! We are absolutely in love with it! You can check her gallery here. Follow @couturebyjennnifer. The photo is from their account. Founded more than 5 years ago by Lurell M., Lurelly creates sensual, classy, and luxurious wedding dresses for the modern woman. Born and raised in Jamaica, Lurell had a clear purpose: to create clothes that make women look and feel beautiful. The Lurelly Bridal Line is handmade by their designer in their Los Angeles Showroom. You can find the designs here and our favorite pearl wedding dress below. Follow @lurelly on IG. The photo is from their account. Nükhet Gelen is a Fashion designer from Izmir, Turkey who is truly talented. Specialised in haute couture, Nükhet Gelen first worked with several fabric companies as a designer, before founding her own company. She loves her job so much, that it became a part of her. She can create contemporary designs based on your own thoughts, plus, she is able to design pearl dresses according to various shapes and colors. Here are a few of her pearl wedding dresses. More designs can be found on Instagram. Follow @nukhetgelenhautecouture on IG. The photo is from her account. Robert Bullock is a self-taught designer, who grew up in the Gulf Coast of Mississippi. With an impressive background in the design and manufacturing industry, he launched Robert Bullock Bride. This gave him the opportunity to create gowns at an affordable price and bring joy to brides who could not afford a couture gown. We feel that his pearl wedding dresses are absolutely mesmerizing. Just look at these designs and you’ll notice the refinement and elegance. You can also browse through his latest designs here. Follow @robertbullockbride on IG. The photo is from their website. At Silviyana, we are encouraged to adopt an eco-indie wedding attire. This is one that is created and hand-crafted using natural products and meticulously and delicately designed by designers that are progressive and not afraid to re-write the rules. If you’re looking for a sophisticated pearl wedding dress, then pick the one made by Tony Hamawy, one of their talented indie-designers. Made of silk crepe back satin, this gown has a pearl encrusted top that will win your heart. Check the online store for more wedding dresses. Follow @silviyana_weddings on IG. The photo is from their account. Suzanna Blazevic owns an Australian fashion studio of Haute Couture bridal and evening wear customized in exclusive and luxury fabrics. The designer’s passion is clearly shown in her beautiful creations. She is dedicated to make your special day memorable and her wedding dresses with pearls are truly elegant! You can also find Suzanna on Facebook. Follow @suzannablazevic on IG. The photo is from their account. A wedding dress with pearls is hard to design, especially when the details should be encrusted in order to blend perfectly with the dress. At Velani you will find perfection and finesse in execution. Founded by Nicky Apostolopoulos, a Sydney based designer of bespoke bridal, evening and christening wear, the studio is always trying to incorporate a contemporary edge to a classic style. Nicki’s pearl wedding dresses look truly divine! Have a look at her designs on Facebook too. Follow @velani on IG. The photo is from their account. Follow @velani on IG The photo is from their account. Launched by Veluz Reyes, Veluz Bride is known for impeccable designs and stunning details without compromise. Veluz’s creations reflect the happiness every bride feel inside and the designer’s talent. Since she turned 26, she focuses on offering the bride a remarkable and flawless experience. A pearl wedding dress is beautifully executed at Veluz, and you’ll notice that the pearl back buttons are like her signature mark. The latest Veluz collection can be spotted here. Follow @veluzbride on IG. The photo is from their account. At White Meadow, you’ll find wedding dresses for modest budgets and big dreams! The fact that they set out to reinvent the business of luxury wedding dresses was challenging but rewarding. If you look through their dresses you’ll notice the names of their dresses reflect daily doses of life, romance and love. We absolutely adore the fact that their pearl wedding dresses seem inspired from fairytales. Hip, fluid, charming, and delicate! Just admire these photos. Follow @whitemeadowbridal on IG. The photo is from their account.